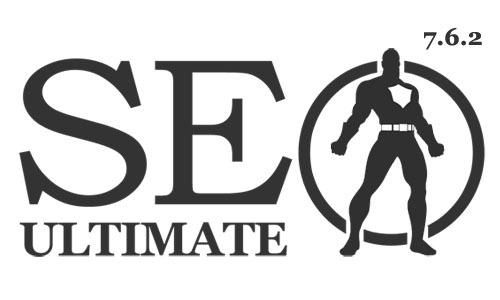 Today we’re releasing a major update for SEO Ultimate (7.6.2) and despite the minor numeric version change vs. a jump to say version 7.7, our new lead developer Aleksandar rewrote vast swaths of the core code (as many of the older features were written way back in the in PHP 4 days and needed to fast-forward to present). We will also be rolling out additional features shortly (additional rich snippet options and media uploader tweaks for sharing your content from the page level) and even more user-interface enhancements to expedite work-flow. There are a few feature enhancements (twitter card tags in the Opengraph Integrator module), but this update was more all about two things, 1) cleaning up any deprecated code or features to ensure compatibility with WordPress core updates and 2) integration into our new framework (as the primary SEO module). 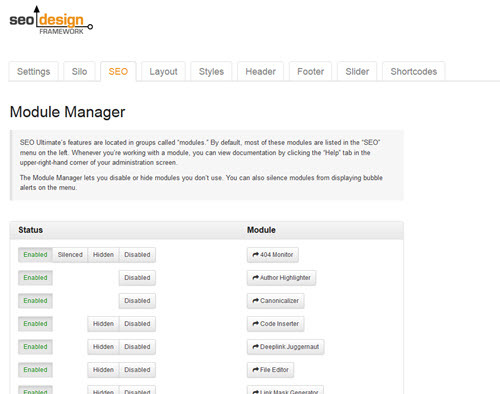 Upon logging into the main dashboard you’ll notice a slightly different look in the modules main screen. Have no fear, the same functionality is present to prevent culture shock in lieu of an entirely different interface, but slightly more polished with buttons for the enabled, silenced, hidden or disabled option for the modules, as well as the module names now have buttons instead of text to jump to the more granular controls for each module. 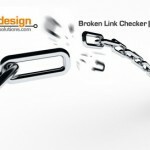 SEO Ultimate is now part our next generation of WordPress tools called the SEO Design Framework. 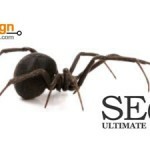 The SEO Design Framework is a revolutionary framework developed to create beautiful drag and drop design, website silo architecture and implement advanced SEO principals in a simple easy-to-use interface. 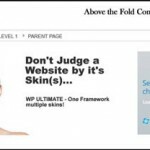 All of SEO Ultimate’s Global modules now live under one settings tab (the SEO tab) inside the framework so, it’s compact and unobtrusive, yet as powerful as ever. 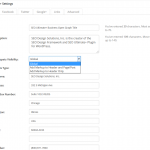 The tabbed theme recurs throughout the framework to compartmentalize things into two prominent states, Global (where the defaults live) and Local Page Level Settings (to override global settings and customize content further). To learn more visit the SDF features page. As we mentioned above, additional Open Graph tweaks are now live in the Open Graph Integrator Module for advanced Twitter Card functionality. On the left before the input field you can read a brief description on how to use that field (ranging from twitter site, side ID, creator, creator ID, image, labels, gallery, raw video or audio stream, twitter player for video, and Apps for iPhone, Android or Google Play Store). 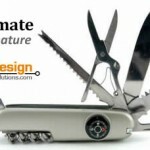 Enjoy the updates to SEO Ultimate and let us know what new functions and features you would like to see so we can follow up with SEO Ultimate Premium. 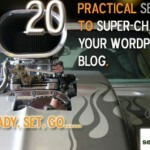 We love WordPress and look forward to providing new functionality and support for SEO Ultimate shortly. Also, check our the limited-time introductory offer for the SEO Design Framework, essentially you’ll get the framework, the SEOBizz Child theme, and an additional Quick Start Settings File for Only $69 You can preview the framework and themes here. Follow me on twitter or add me to circles here.